Debut author Homer chronicles her experiences traveling via cargo freighter. Homer’s first book is an adventure story—the journal of her 49-day trip through the South Pacific as a passenger on the Louise, a cargo freighter. The author hates flying, and had no interest in a cruise ship’s gorging and gambling, so she decided, why not rough it? From Costa Rica to Australia and back, by way of Tahiti, Fiji, New Caledonia, and New Zealand, the Louise churned its 45,000 tons (cargo and author included) into the “open-ended silence of the sea.” Its passenger comes away with plenty of good stories to share along with “a decidedly unromantic view of the life of a seaman.” In Fiji, Homer missed out on seeing Raymond Burr’s orchids but did visit a pricey resort with “a man-made island in the shape of a giant footprint.” In former colonial islands, she discovered to her chagrin that “the French seem always to be French, no matter where they are.” The glorious and the grim are each delineated in detail, from the “foreign country of constellations in the sky” to the constant awareness that “a freighter is a noisy, dirty, smelly beast.” The aches and pains of travel are here in full measure: the cold of the ship, the pangs of arthritis in her knees, and the limbs barked against listing furniture. Because much of the journal comprises minimally edited diary entries and letters to friends, the reading experience can be choppy, especially since past and present tense mingle freely. But because of the immediacy of the reporting, Homer’s character—questing, worrying, laughing—comes across with terrific clarity. We come to know her well, or feel as though we do, and the curious world of cargo ports and the crews that visit them become even more intriguing through her eyes. 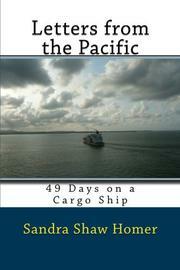 This entry was posted in Uncategorized and tagged cargo ships, Letters from the Pacific, ocean travel, travel memoir. I’m thrilled for you Sandy!!!! Congratulations!